I know this doesn’t have a lot to do with real estate…well, maybe it does….but last night I was fortunate enough to be invited to an airing party for an episode of Oregon Art Beat produced by Oregon Public Broadcast. 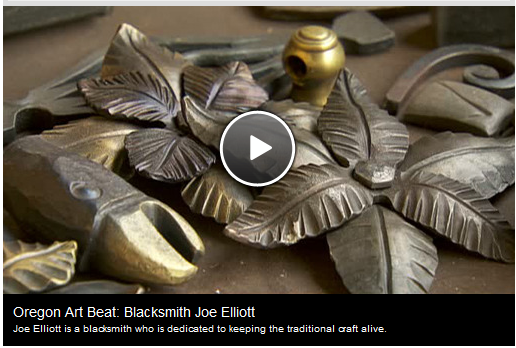 The feature story was on Bend, Oregon’s own Joe Elliot, a master blacksmith with a forge in downtown Bend. In fact, that was the location of the party. Surrounded by iron, steel, fire, tools, food, and some of the most interesting people that Central Oregon has to offer. Now, here’s where it has to do with real estate. The pieces of art, both functional and beautiful, that Joe produces adorn some of the finest custom homes around. If you are looking to build from scratch or remodel in the Bend Oregon area, you owe it to yourself to give this guy a call ans see what he can offer. It provides any home with a dose of authenticity that anchors it in Central Oregon. We’re a very fortunate community to have talent like Joe’s among us. For those of you that didn’t get to see the original airing, here is the segment for your enjoyment. Also, the home filmed in this episode is for sale in Broken Top. If you are interested,contact us and we’ll let you know who it is. Oh, and let’s not forget a link to Joe’s website at DryCanyonForge.com!